A big question people seem to have with Letters of Grace is, how do you use the Language Lessons? My answer to that is, any way you want! To let you get an idea of how they work for our family, I am going to share the process of teaching my Kindergartner to read. In my 6 years of homeschooling, I can honestly say there is nothing as intimidating, or as rewarding, as teaching a child to read. Each child is different, and each one has a timeline that cannot be forced. The crocodile hunter was reading by Christmas of his kindergarten year. The little princess was not ready until well into first grade. Now, they both read the exact same novels. So, here I am, doing it for a third time with the Queen. I was not in a hurry this time, after all, I have enough to do trying to get through other subjects! So, we have taken it very slowly, enjoying our Letters of Grace activities, without a lot of fuss. She is 5 and a half, and until we began Letters of Grace in January, I had not done ANY letter work with her at all. She knew how to spell her name, and new the sounds of a few of the letters. It is interesting to see the process, as she decided a few weeks ago it was time for her to learn to read. Ever since, she bugs me on a daily basis to teach her to read. Really, there are very few things needed to teach a child to read. A set of alphabet letters, paper and crayons, and some books (in Letters of Grace we suggest you begin with the Bob Books)are really all that are necessary. 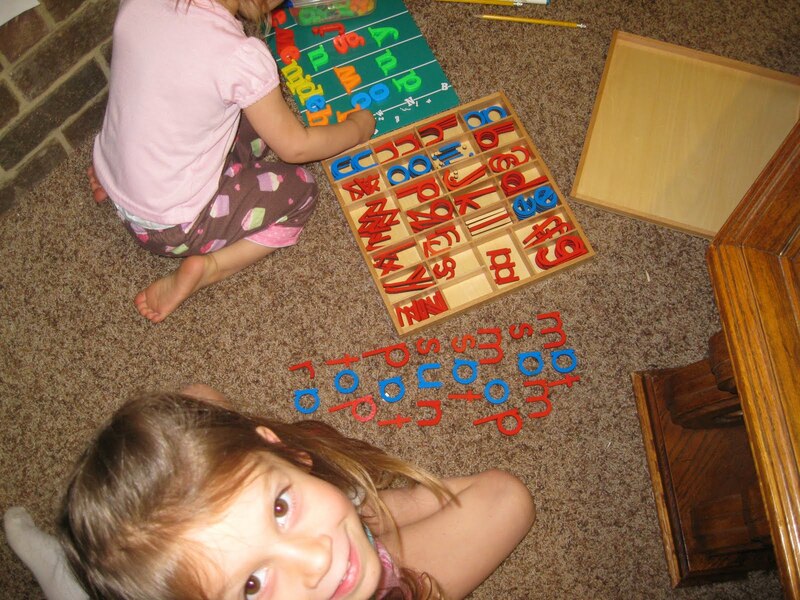 I chose to invest in a nice wooden set of letters, but refrigerator magnet letters could be used (be sure to find ones with lowercase letters! ), or the wonderful free moveable alphabet available to print off from Letters of Grace. We started by becoming familiar with a few letters. I introduced her to the sounds of S,T and M in addition to the letters A-F we covered with Letters of Grace. I usually begin with only 3 sounds, and we drill and play with those for a few days. When I say drill, I start by making the sound of a letter, and having her point to the letter. Once she can do that consistently, we move to me pointing to the letter and her making the sound. We spend no more than 5 minutes a day on this activity for about a week. 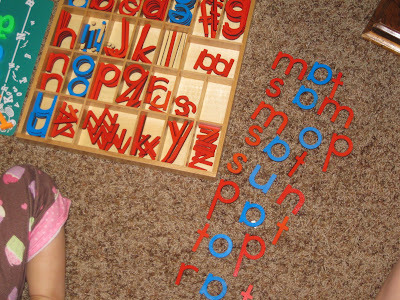 If she gets bored with the letters, or is ready, I might add one or two more sounds to practice. If you are using Letters of Grace with a preschooler, then by the time your child is developmentally ready to read, he will already be familiar with the sounds of the alphabet and this step may be skipped. Once those sounds are learned, we immediately move to the skill of blending, perhaps the most challenging skill for a child in learning to read. Plenty of advance practice in breaking words up into their sounds is helpful here. For the past few weeks, we have played a game in the car. I slowly sound out a word - ssssss t ooooooo p. She has to guess the word. As she became skilled in that, I let her try to slow the words down (this is harder for a child, and will take some help in the beginning). The key is to help the child begin to break a word down into the individual sounds. Then, she is ready for spelling out her own words. I like to start with "am" "an" or "at". Using the "Ses*me Street method", the Queen sounds out each individual letter, as I slowly move them closer. We practice drawing the vowel sound out, then capping it off with the final consonant. Once a child can blend two letters in that way, he is usually ready to tackle a three letter word. Then, you can start to introduce a beginning consonant. Starting with these sounds will allow your child to have immediate success in reading whole words, and allow him to start reading the Bob Books quickly. The process will go smoothly and fairly quickly if the child is ready. If your child is struggling or frustrated, set it aside for a day or two, or even a week or two, then try again. Sometimes it can be a matter of just letting it sink in for a few weeks, then suddenly, that switch will flip! That is the moment I love! We have spent the past few weeks spelling words here and there, probably no more than 15 minutes total a week of me working with her. But, as she got more confident with the sounds, she began getting the letter box out on her own and making lists of words. We slowly added sounds as she wanted to spell more and more words. If you are using the Bob Books as your beginning readers, the Bob Book word lists are provided in a nice spelling format for you to print off under the Level 1 Language Lessons of Letters of Grace. After she successfully read the first Bob Book, she continued to practice spelling those words throughout the week, either with the letters, stamping them, or writing them. Having several options for a child is helpful since many children are ready to read and spell before they have the dexterity for writing (this is especially true for boys). Letters of Grace also provides you with a picture dictionary which may be printed off and filled in as each book is completed. Another fun activity is allowing your child to illustrate sentences from the books. They may write the words, or stamp them, or simply spell them out for you. Having your child spell the words out, independent of the books is a crucial step. Since the Bob books are quite predictable, most children will learn what words are on each page after a reading or two, and will "read" the book quickly by looking at the illustrations. That is okay, it encourages your child, as they are very proud about reading real books! In doing this, they are actually practicing the skill of narration. I will let the Queen quickly "read" the story to me some days, then other days I cover the illustrations with a piece of paper to see how well she is sounding the words out. Practicing the words independent of the story is another way of making sure your child is really reading the words. 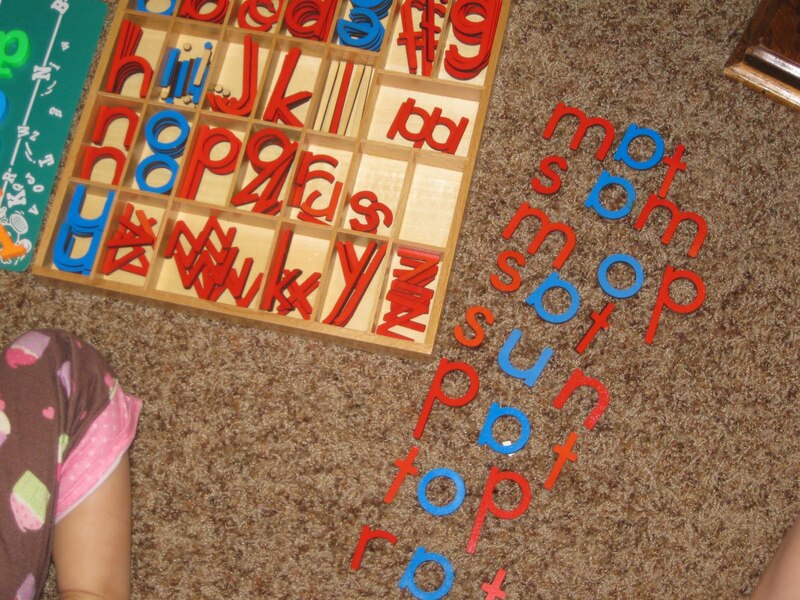 This too can be done with the moveable alphabet. As your child reads through the Bob books, you can keep track of that progress with the Letters of Grace Progress Charts. Post this in a prominent place where your little one can see his achievement, and watch the excitement and motivation grow! For those who want to bookmark this post, it has been added to the FAQ on the Letters of Grace site.